The week leading up to deployment is always a tough one. It can be filled with stress, worry, silly arguments, tears, pressures and challenging conversations. My husband is a soldier who just left for his second deployment today. Fortunately, we had a wiser, more confident approach this time around. That doesn’t mean that our lead-up was devoid of stress — instead, we felt like we had a familiarity of what to expect and what we were capable of. Today, after our last lunch date, he suggested that I write about what we did in the hours before his flight. Being that he almost never provides content ideas, I jumped at it! For those of you who want to know, here is what we did in that last day before deployment. T-24 hours: He began nervously packing upstairs, while I worked downstairs, trying to crank out as much work as I could before acting as a single parent for the next several months. Our children binge-watched TV, and this time, we were okay with it. T-23 hours: I realized that I completely forgot to cook and the two adults in the house were both emotionally tapped out. Luckily I had a pizza in the freezer and — tada — dinner was saved! T-22 hours: He spent extra time playing with the boys in the evening. He played checkers with one and ran a bath for the other, talking to him while he splashed around in bubbles. T-21 hours: He handled bedtime for the last time for months, reading to the boys and giving them extra hugs and kisses. T-20 hours: We drank some of his homebrew beer (the last alcohol he’d have for months) while binge-watching Netflix together. T-19 hours: He received a thoughtful email from my dad, a Vietnam veteran, who sent lots of love and support as he prepared to enter a quote “war zone.” Those words rang out and reminded us of exactly what he volunteered to do. T-18 hours: We discussed fears, changes, regrets and plans for the future. I encouraged that he simply get some rest for the night and make it through this deployment. I assured him that I would hold down the home front in his absence. T-9 hours: The kids had a two-hour delayed start at school due to snow, so we savored the extra time and enjoyed coffee while they played. 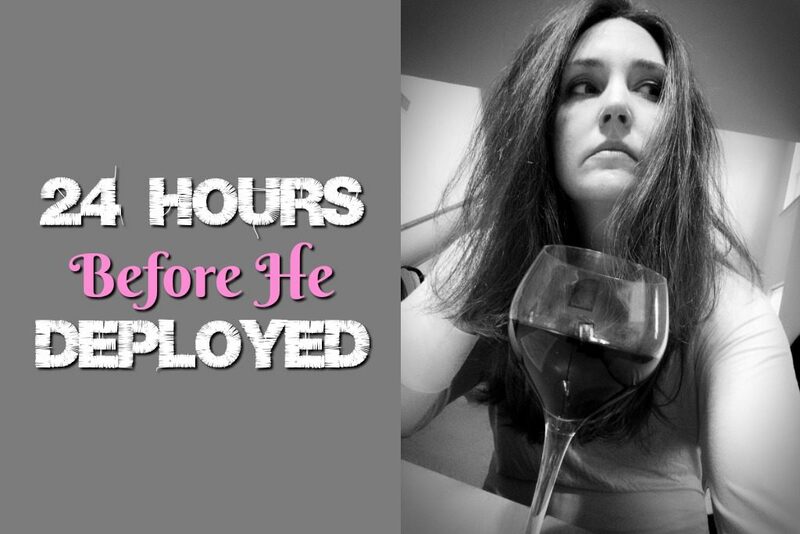 T-8 hours: He began getting nervous, wanting to double check his documents, packing job, etc. I threw myself into work with emails, phone calls and writing. T-7 hours: He went into his office to clean out his desk. I continued to write as if once he left, I wouldn’t find quiet time to work over the next few months. I know this wasn’t realistic, but I was on a mission to accomplish as much as I could ahead of time without burning myself out. T-6 hours: We went out for our last lunch together at a Vietnamese restaurant for rolls and Pho. It was absolutely delicious. As we wolfed down our food, we realized that we had survived only on coffee that day — we had both forgotten breakfast. Very uncharacteristic of us… Next up? I decided that although I’d been following an exercise and eating regime, I suggested that we hit the store for junk food and alcohol. We bought pizza rolls, Doritos (buy one get one free for the win), a box of wine, and Gatorade (for tomorrow…always prepared). T-5 hours: As I did more work, I heard him loudly sigh from the other room, pace, and could tell it was hitting him. I decided to put down my phone, close my laptop and focus on him. Work wasn’t going anywhere — he was. T-4 hours: We cracked open a bag of Doritos and watched part of the movie “Beerfest” as we waited for the kids to return from school. Once they did, it was “go time” and we’d need to leave for the airport. T-3 hours: The kids came home, dad enjoyed some sweet conversations, lots of hugs, and it was clear that the clock was ticking. It was time to make the drive to the airport that ended up taking four hours round trip. T-2 hours: In the car on the way to the airport we made a joke about Holiday Inn and to lift his spirits, I suggested we listen to Chingy’s “Holidae In” so we did. Although I had fun with it, I could tell he was somewhere else. We turned off the music and talked for the remainder of the drive while the kids quietly watched a movie in the back. T-1 hours: We parked at the airport and all walked inside the terminal. We said our goodbyes, snapped some photos and made sure we all enjoyed a long hug. Although sad, I knew that for me, it was go-time. The boys and I held hands through the parking lot as we walked back to the car. While they buckled up in their booster seats, I posted our farewell photo on my Instagram. I located a McDonald’s on my GPS and surprised the kids with Happy Meals. The boys and I made it back home, my phone blew up with messages and well-wishes, thoughts and prayers and — somewhere in the middle of this — his flight departed. I got the kids to bed, and before I cracked open my wine, I started writing this piece. Why? It was fresh. Why else? He asked me to. While I sit here in our home, on our comfy couch with my normal life, he is on a flight to an unknown. I told him that we would handle things while he was away, and here we go. These are the first few moments of the next several months. I know that this is an intimate and personal read, but I hope that by sharing it with you, you’ll see that we may have some things in common with your military family. Although our experiences may not be exactly alike, we have common ground and are all in this together. Thank you for reading and supporting our journey.